Breakfast is definitely my favorite meal of the day. Not only does it get my day started off on the right foot, it is also the only meal where it is socially acceptable to eat sweets. (Think about it, muffins are just breakfast cupcakes and pancakes are literally pan cakes!) While I will happily take full advantage of the pancake/waffle section of any brunch menu on the weekends, during the week I do try to be a bit healthier in my breakfast choices while still satisfying my 24/7 sweet tooth. Which is why I love this new(ish) overnight oat trend! It takes a good ol' breakfast standby (oatmeal) and turns it into something that could almost be dessert. Or in the case of these apple pie overnight oats, it takes a favorite dessert and turns it into a respectable breakfast. I should say, a very respectable breakfast. To make these apple pie overnight oats, I didn't use a single gram of sugar. I did use honey and maple syrup to sweeten it up a tad, but if you are watching your glucose intake, you could cut them out completely. First, I mixed together the applesauce and the apple pie spice in the bottom of a jar. Then I poured in the milk. In this case, I used unsweetened almond milk, but you can use whichever milk product you prefer. Lastly, I poured in the oats and mixed them in with everything else so that everything was evenly distributed. I popped the jars into the fridge so that they would be ready for me in the morning! The oats are delicious on their own. But to really conjure up that apple pie flavor I made an apple topping that is basically just apple pie filling, minus most of the butter and all of the sugar. The apples on top also added just a bit more sweetness to the oats which really made me feel like I was eating dessert for breakfast. Except unlike the muffins, pancakes, or waffles I have most weekends, this breakfast is actually pretty dang healthy. One other benefit of overnight oats that I forgot to mention is that you can make a bunch up ahead of time; then, in the morning you can grab your oats and go! I have found that the oats stay good in the fridge for three or four days. So I make up a couple jars on Sunday night, and I have breakfast planned for the rest of the week! Into two clean jars with lids, pour in an equal portion the apple sauce, milk, honey, and spices into each jar. Stir the ingredients. 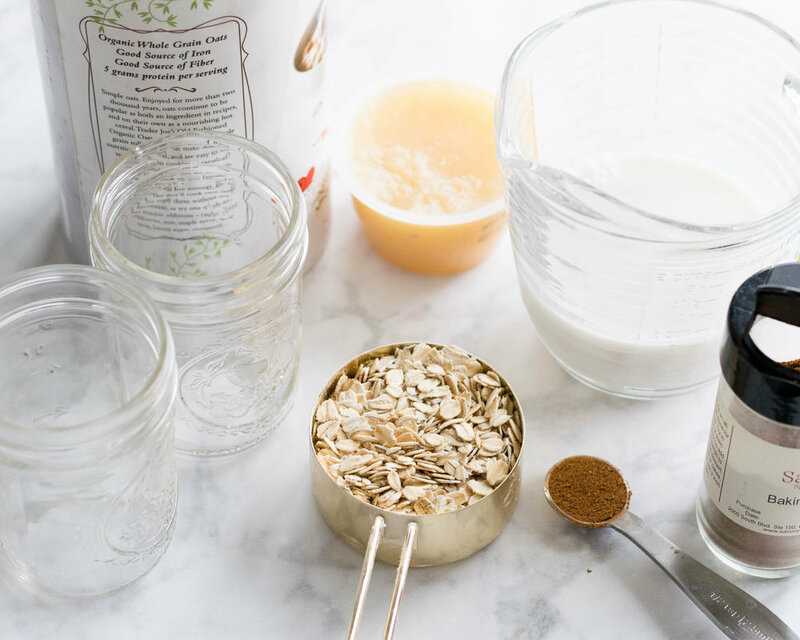 Spoon an equal portion of the oats into the jars and mix the oats into the other ingredients. Put the lid on the jar and place in the fridge overnight. To make the topping, spoon ghee or butter into a hot pan over medium high heat. As soon as it is melted add in the apples. Stir apples around to get the pieces coated in the butter. Sprinkle the spice mixture over top and pour in the maple syrup. Reduce heat to medium so that the apples don't burn. Continue stirring the apples until they are tender. About 7 to 10 minutes. If the apples start to burn before they are tender, add a tablespoon of water to the pan. Store the apples in an airtight container overnight. When ready to eat, spoon apples over top of the oats. Top with maple syrup and pecans (optional).